Simon and Kirby were big self promoters. 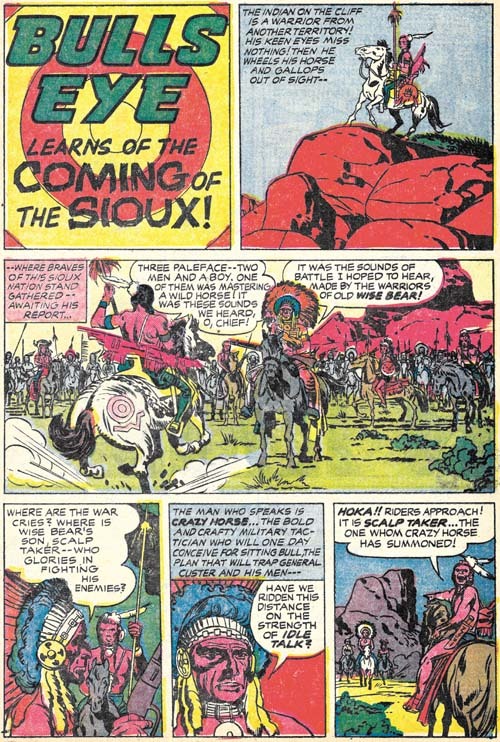 They often signed the art they created and included a “Simon and Kirby Production” label in the books that they put together for Prize Comics. Which is why it was so unusual that their names were never used in any of the earlier issues of the Mainline titles. 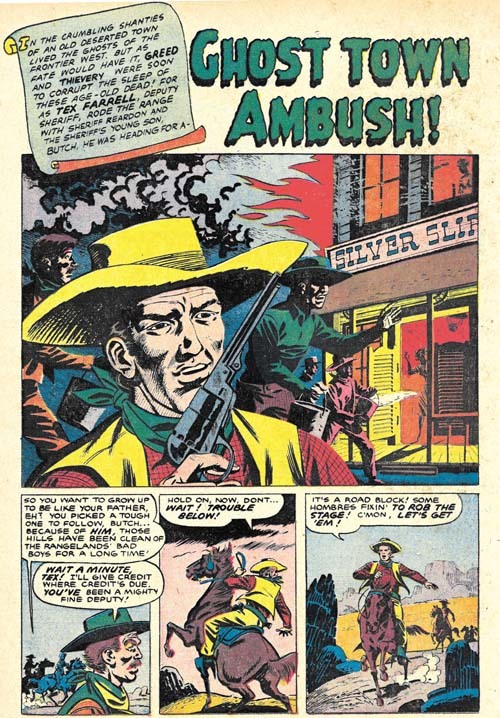 Bullseye #5 was the first to include a stamp reading “another Simon and Kirby smash hit”. 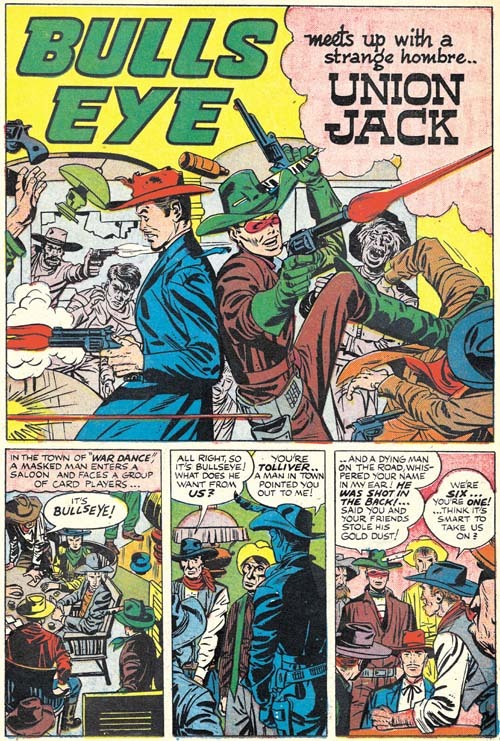 The exclusion of their names from the Mainline titles up to now was probably an attempt avoid a conflict with Prize for whom Joe and Jack continued to produce comics. I do not think it is a coincidence that the first issue with the Simon and Kirby stamp was also the one with the first postal statement in which Joe and Jack are listed as the editors. If the people at Prize had not figured out who was behind Mainline Comics before this, the gig would certainly have been up with this issue. 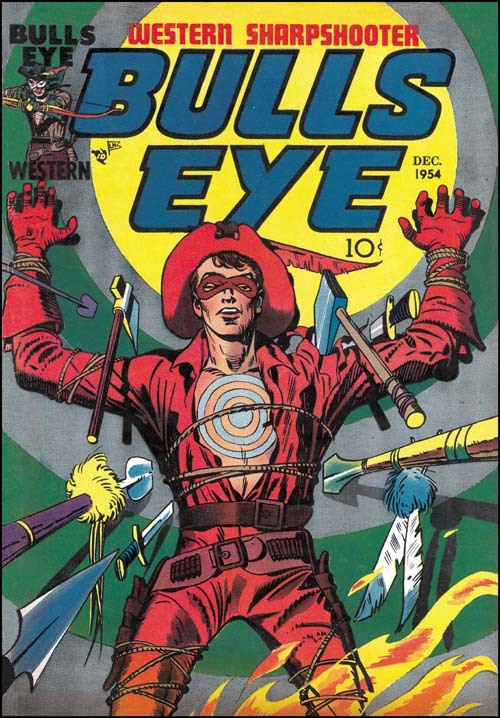 My favorite Simon and Kirby cover keeps changing depending on my mood, but if I were to pick the top dozen covers they would always include that for Bullseye #5. The bulls-eye pattern has played the central design element of all the title’s previous covers, but it was truly inspirational to convert it using Indian motifs. The bulls-eye now looks like some sort of flattened teepee. It is a pretty busy pattern, so the foreground is just Bullseye grappling with an Indian. The whole thing is topped of by some really beautiful inking of the figures by Jack Kirby. The image I provide has not been restored but rather was based on progressive proofs. Progressive proofs were made of the individual color plates and the sequential combinations that they would undergo during printing. This usually was done from the lighter colors to the darker ones so that proofs were made of yellow, magenta, yellow + magenta, cyan, yellow + magenta + cyan, black then the completed combination of all plates. The above image was made by scanning the individual proofs for yellow, magenta, cyan and black then overlapping them in Photoshop. No editing was needed to provide the most accurate recreation of the original Bullseye cover possible. 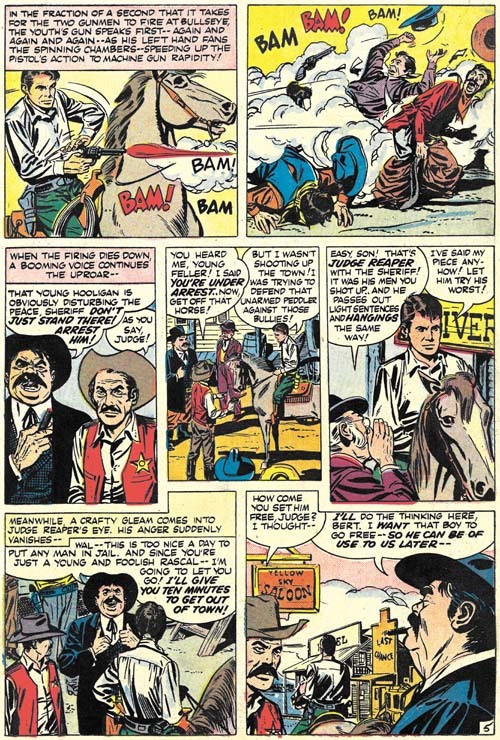 A classic western tale of a cowboy accused of murder, a lynch mob looking to bypass justice, a bounty hunter aiming for a payoff at any price, the true killer trying to pin his crime on an innocent man, and off course Bullseye to save the day. 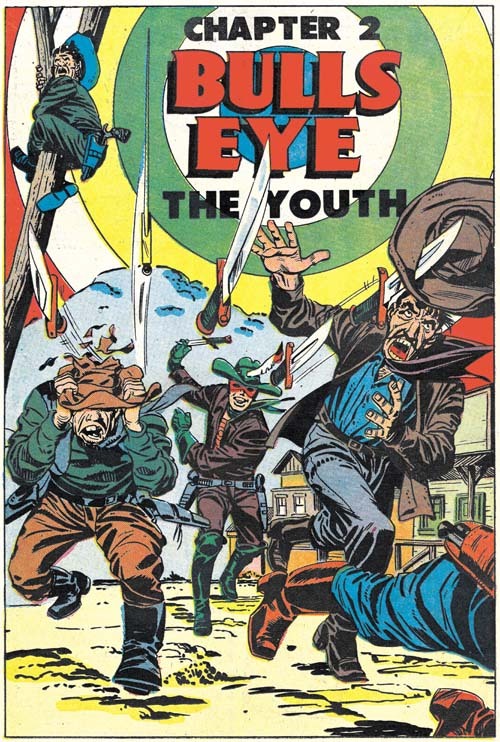 This is the first issue of Bullseye published under the overbearing eye of the Comic Code Authority. 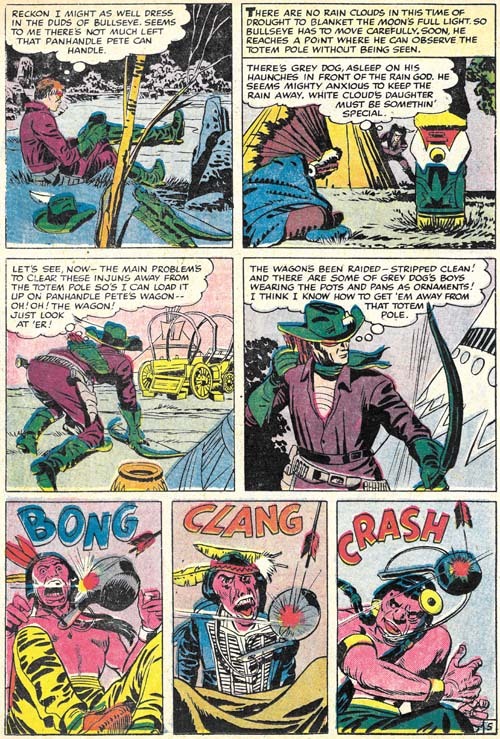 However Bullseye was never overly violent and so the censorship does not really detract from this fine story. 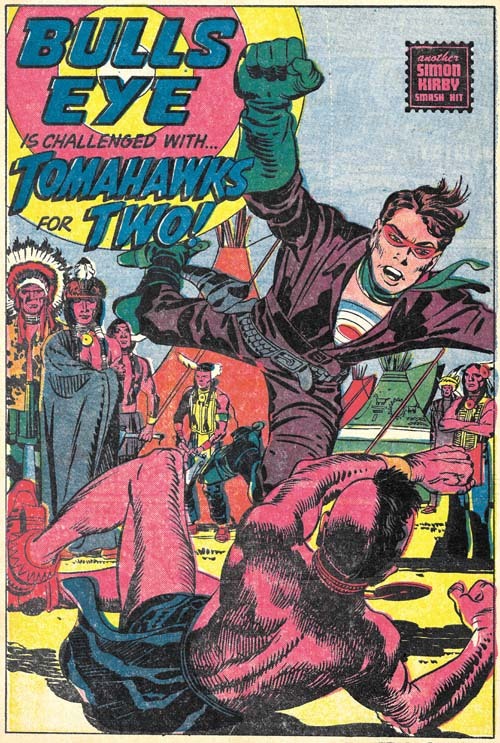 “Headhunter” was pure drama so Simon and Kirby backed it up with a humorous piece, “Grandma Tomahawk”. 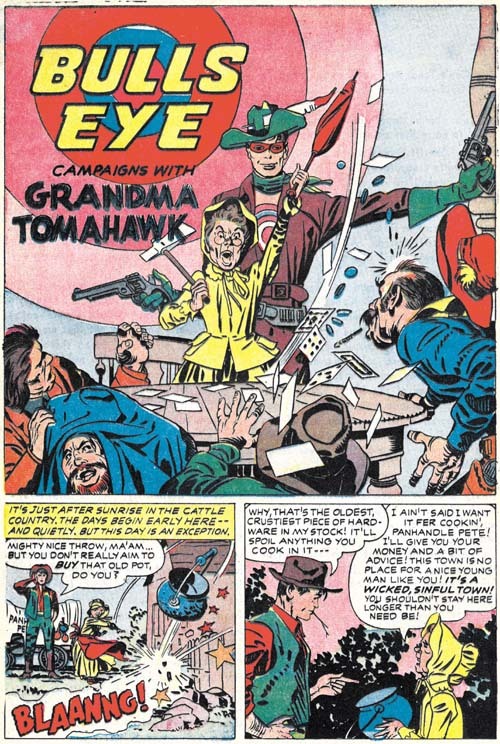 A small but spunky elder lady leads a crusade against alcohols and immorality with secret help from Bullseye. One again inked by Kirby himself except for page 2. Another humorous piece but this time drawn by an artists other than Kirby. Frankly few attributions have given me more trouble than trying to figure this piece out. There are suggestions of Mort Meskin throughout but on a whole this look so unlike his work that I very much doubt that he was the penciler. The inking is very distinct from Mort’s style as well. I played with the idea that this might be have been done by George Roussos whose work often shows Meskin’s influence. But comparing side-by-side this piece with some by Roussos shows they are very distinct. And again the inking is nothing like that by Roussos. It is very frustrating not to be able to come up with a convincing attribution because the artist clearly was very talented. 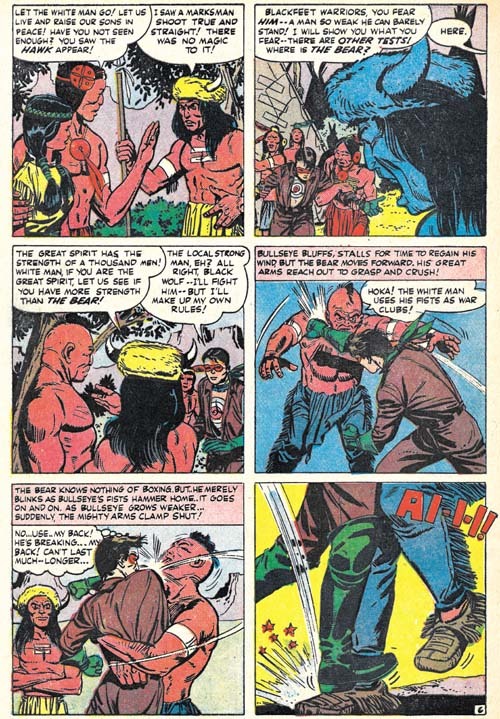 Mort was not that common a name so I consider the placard with that name in panel 4 as a homage to Meskin by the artist of this piece. 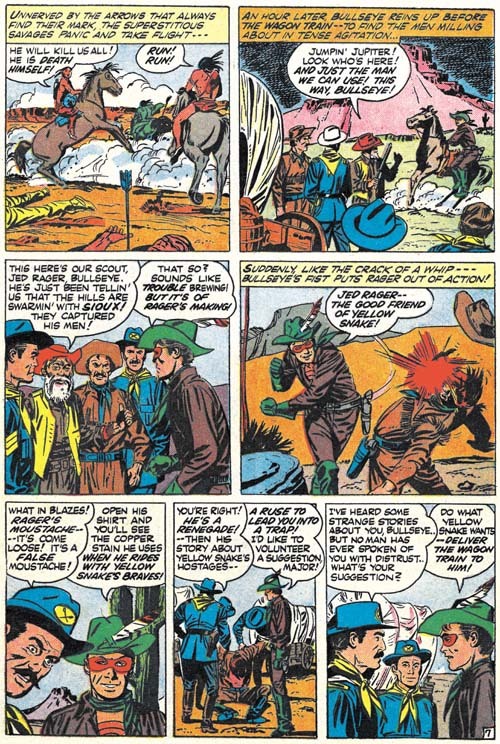 I do not think it is a coincidence that the leading lady of “Tough Little Varmint” and “The Adventures of Sheriff Shorty” (Bullseye #3 link 1) were both named Penny. The most likely explanation would seem to be that the scripts for both were done by the same writer. 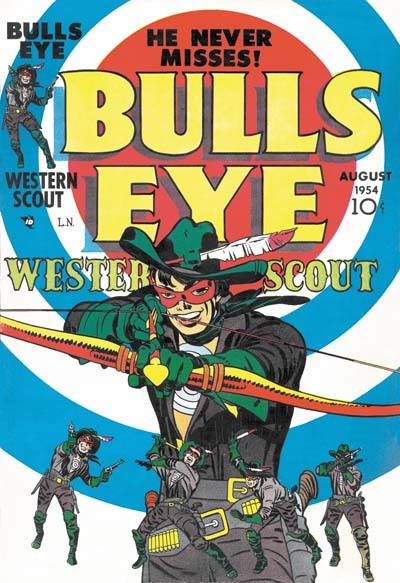 The cover prominently includes the target in its design, as do all the Bullseye covers. The original art for this cover still exists. However apparently the top of the original art had been cut off (probably by Simon and Kirby to be recycled for another cover). In cases like that it is common that the art would be restored by adding a stat of the missing piece but in this case the entire top section was inked by hand. The restorer did a good job with the lettering but pretty much botched up the small figure of Bullseye throwing a tomahawk. Like the last issue, this one has two Kirby penciled and inked Bullseye stories. As I mentioned before this was much more Kirby than any other Mainline title. 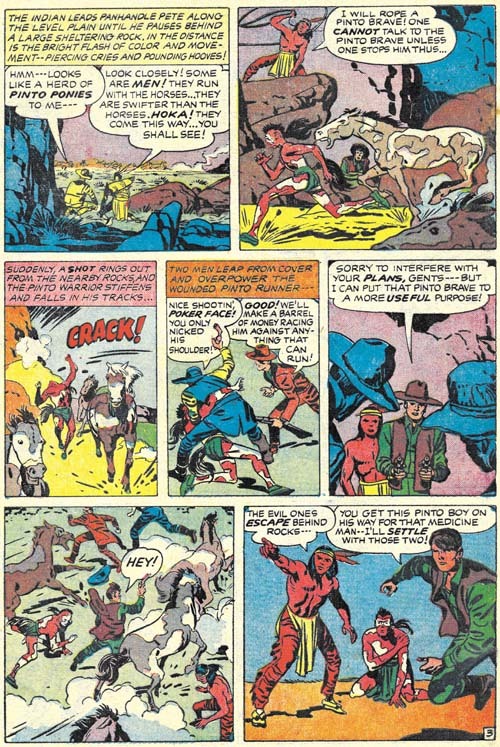 A wounded man seriously in need of medical attention, an Indian warrior desperately seeking a rifle, an Indian tribe that runs with their horses not on them, and two villains out for what they thought would be an easy score. This is a very imaginative but rather meandering tale. It would seem to me that this story has more of Kirby and less of Simon than usual. Some readers may like that others may not. Not only faster than their horses, the Pinto braves never stop running. You even have to lasso one down in order to have a discussion. I am not sure why they have the horses to begin with or where they are running to. For that matter where are the rest of the tribe? But the story moves so fast and the art is so terrific that chances are the reader does not even get around to be bothered with all of that. “Doom Town” is a more classic Simon and Kirby story. Here our hero is accompanied by an unusual creation, Major Calamity. A magnet to bad luck so disastrous that people either want to kill him or flee. 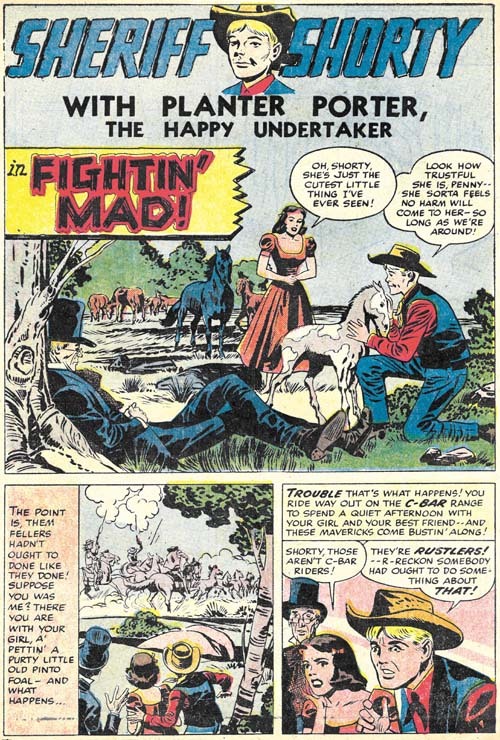 But Major Calamity is not the villain of the story that dishonor goes to Big Red Devlin. 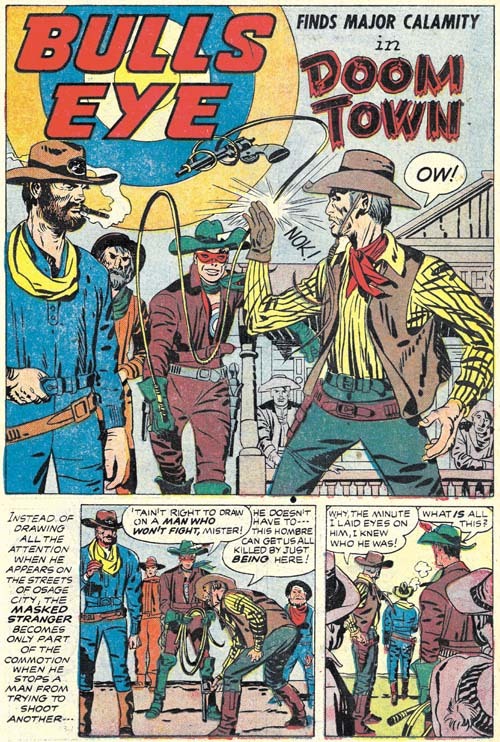 Only Major Calamity can save the town, with of course Bullseye’s help. What follows is pure Simon and Kirby. Plenty of action, a great fight and a touch of humor. Fortunately this story has been reprinted in “The Best of Simon and Kirby”. 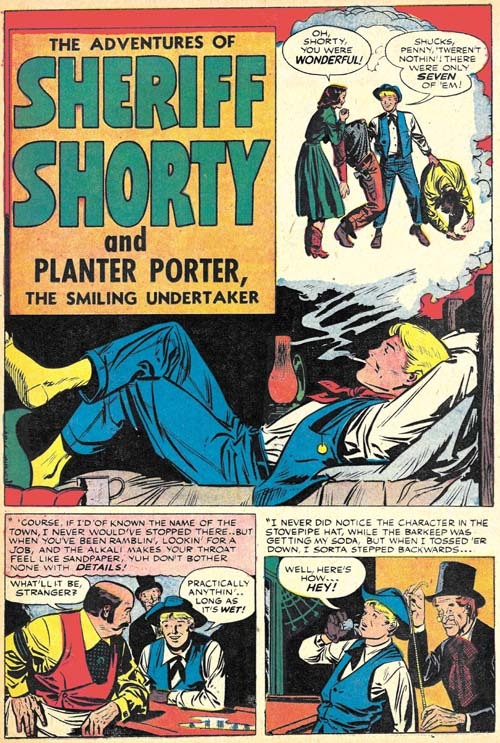 No sooner that the Sheriff Shorty feature gets introduced than its place is taken by another story. (Do not worry Sherriff Shorty will be back.) Frankly “Ghost Town Ambush” is a pretty poor replacement. I do not know who the artist is but he really is not all that good. If anything the writing is even worse. It tries to use all the cliches but nothing seems to work. 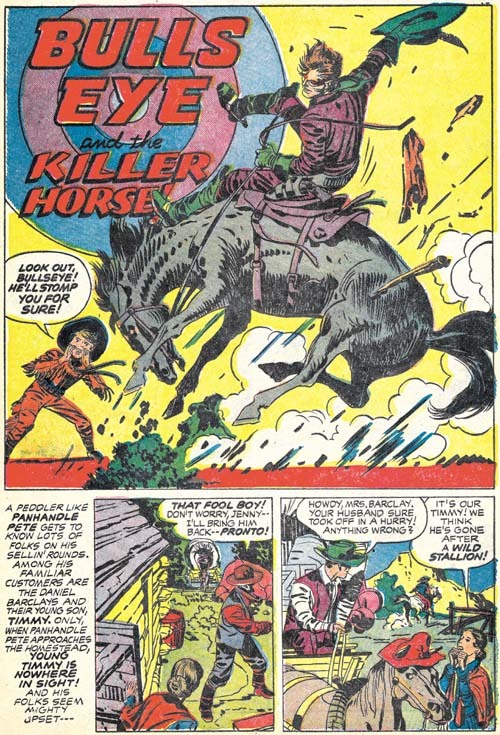 A one point a villain on a horse sneaks up behind a sentry all the time saying out loud what he is doing. Boy some sentry. All in all this is surely the most forgettable story in the entire Bullseye title. 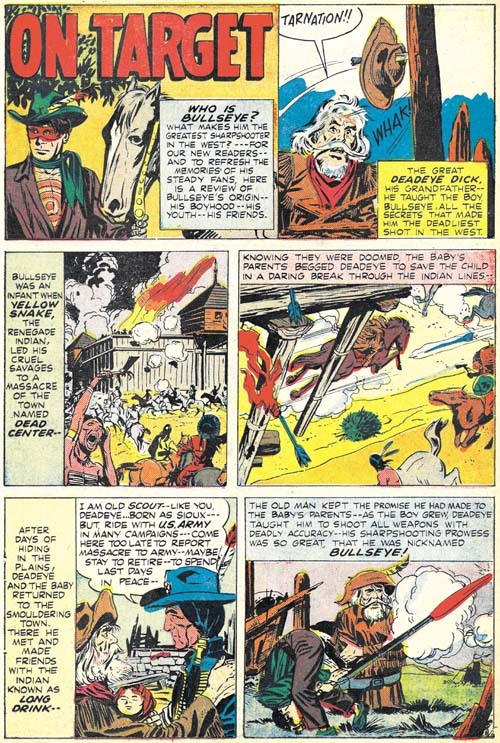 The first two issues of Bullseye could be considered as a scaled down version of the Simon and Kirby MO; Jack drew or laid out the first issue but provided a single story for the second. However Bullseye #3 falls completely out of the pattern. 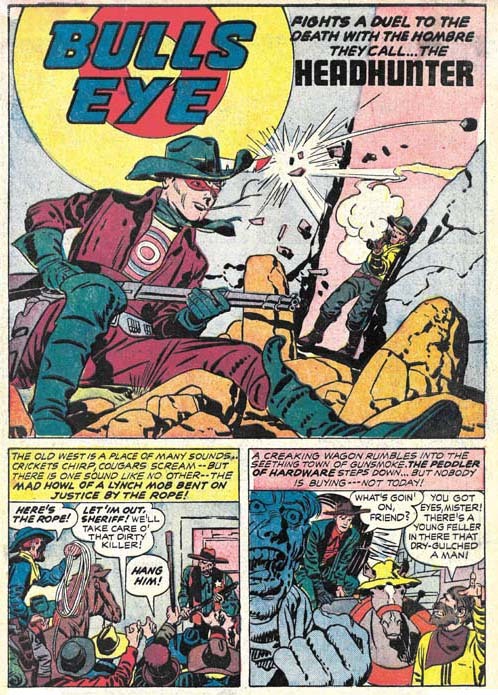 There are two new Bullseye stories in the third issue and both were drawn by Kirby. 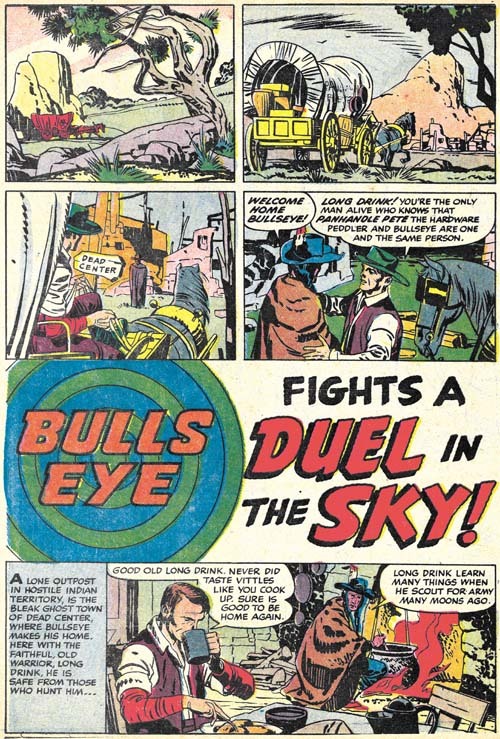 All the subsequent issues of Bullseye would also have two Kirby drawn stories as well. No other Mainline title would have nearly as much Kirby involvement. Only Fighting American (a Prize title) got as much attention at that time from Jack, and even that title followed the more standard Simon and Kirby MO with less Kirby toward the end. 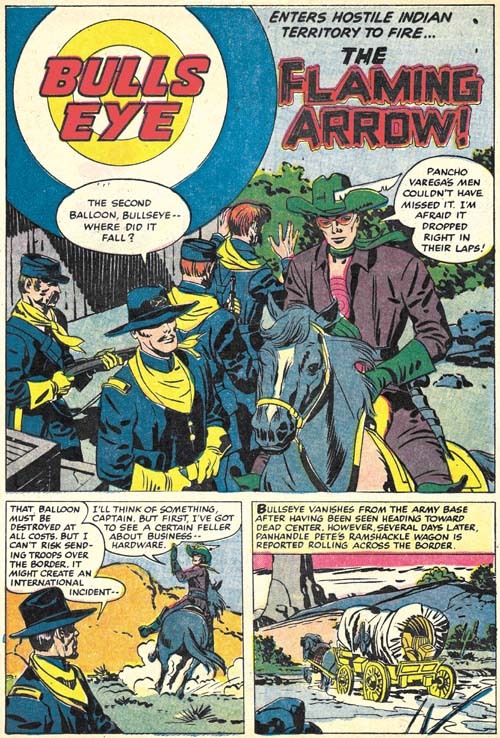 There is little doubt that Simon and Kirby considered Bullseye their most important title at that time. 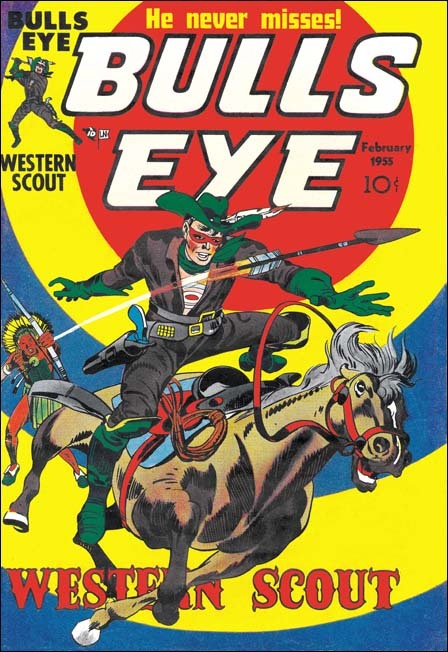 Even today Joe considers Bullseye as one of his favorite comics. In the 50s dinosaurs may have helped to sell comics but frankly they were difficult to make truly threatening. Back then (the 50s that is) dinosaurs were depicted as lumbering brutes dragging their tails along behind. Truly scary dinosaurs, of the Jurassic Park variety, would not be possible until years later when scientists realized that birds and mammals were better models for dinosaurs than crocodiles. 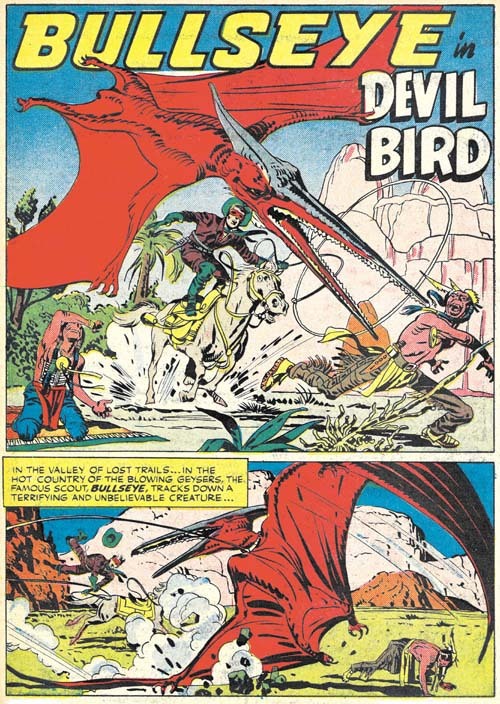 Kirby bypasses all those problems by using in this story the flying reptiles pterosaur (technically not dinosaurs). Devil bird indeed. This is probably the scariest depiction of a prehistoric animal ever in the history of comics. And certainly my personal favorite Bullseye story. 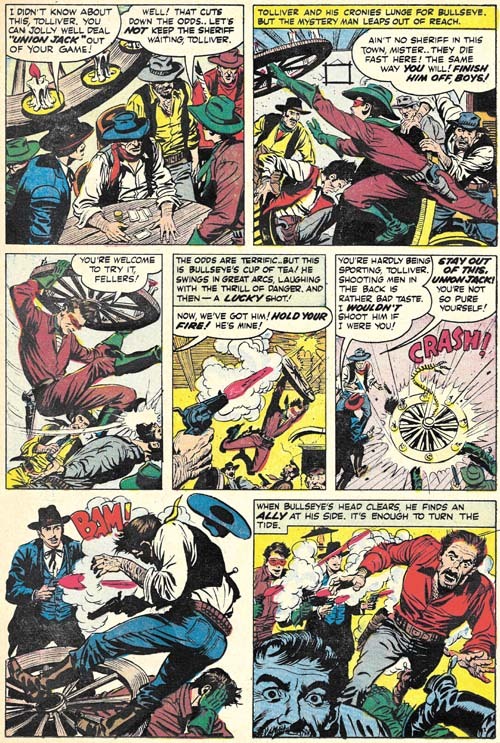 Simon and Kirby decided to include in this issue a condensed version of the Bullseye origin story (they had done the same thing for Fighting American). The original art for Bullseye #1 was done on illustration board, so a razor was used to cut around desired panels and they were peeled off the board and mounted on another. This was a simple and cost effective method but the unfortunate consequence is that today most of pages the original art from Bullseye #1 are missing a panel or two. 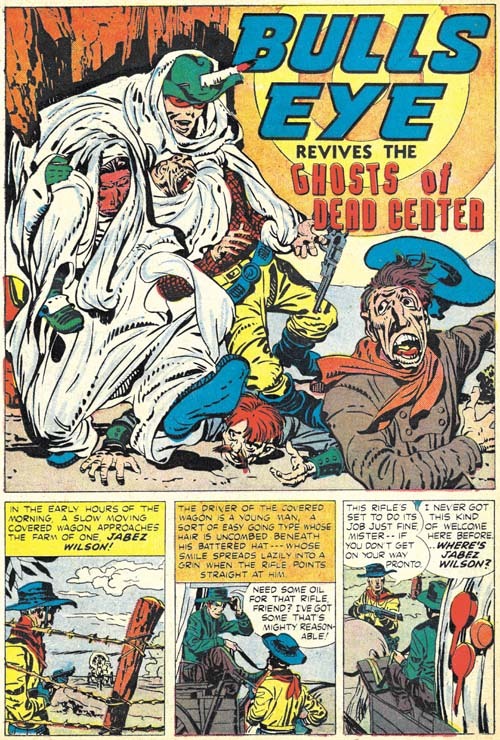 While not truly a humorous piece, “The Ghosts of Dead Center” provides a bit a humor. There is money to be made when the railroad is built through Dead Center. Well that is once it is rid of those pesky “trespassers”. 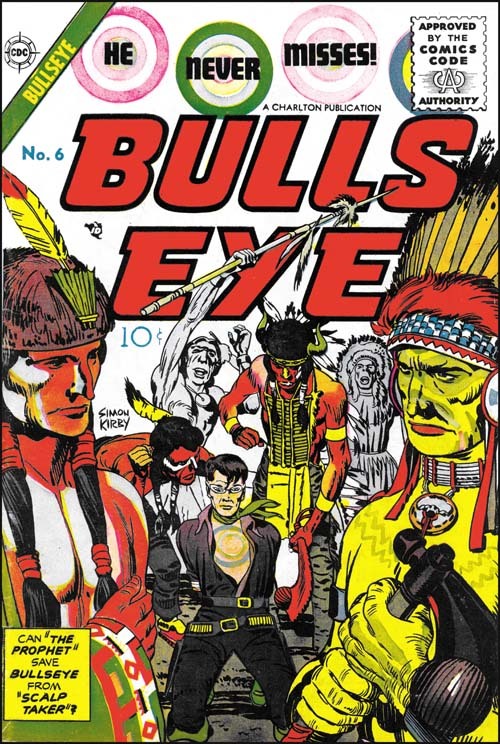 Unfortunately for those avarice villains, Bullseye has overheard their plot and even more unfortunately Dead Center is where he was raised and where his Indian friend, Long Drink, still resides. 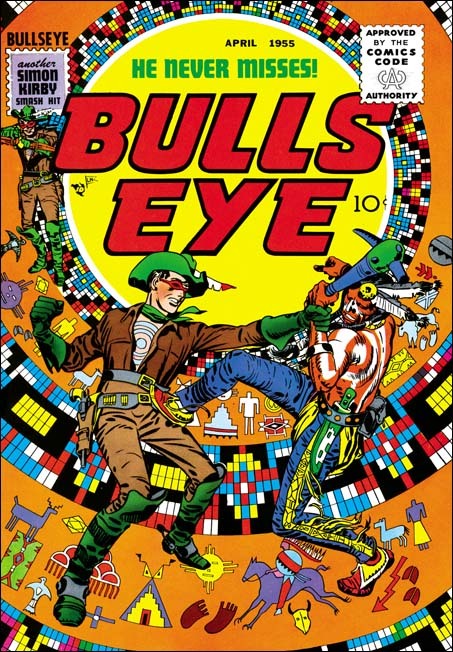 But Bullseye is just one man against many so he uses various tricks to defeat his foes. And that is where the humorous touch comes into play. 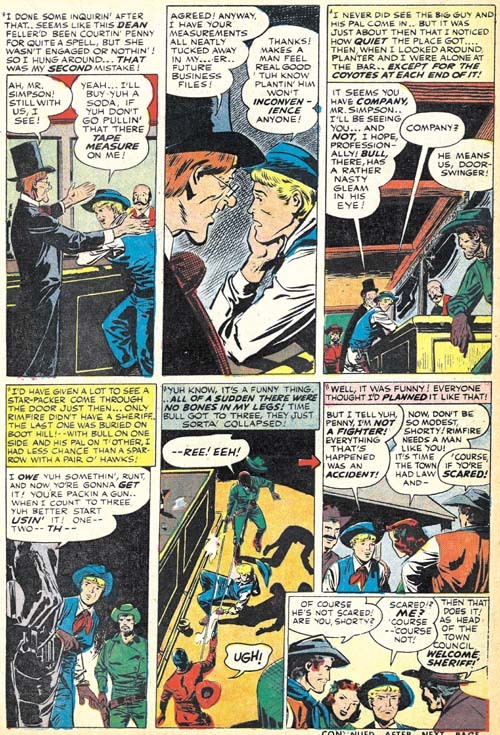 Comics from the golden age did not have anything like the concept of continuity. Once past the tale of the origin and the stories were pretty much independent. This was largely true with Simon and Kirby as well. 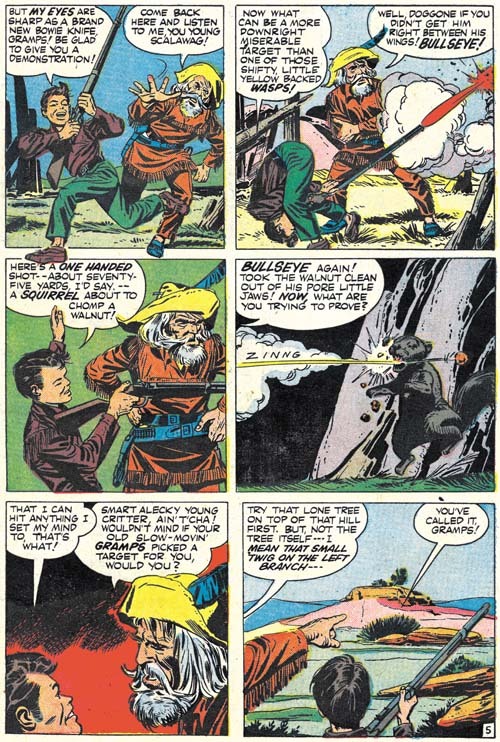 But here at the ending of the golden age we have a story that refers back to Bullseye’s origins. Not quite like modern continuity, but much further than anyone else would use until the Marvel Universe was created in the 60’s. Kirby uses a 7 panel layouts for all the story pages save the last. A more standard layout would have 6 panels so the extra panel meant that none of the pages had a grid layout and some of the gutters would meander across the page. But the last page has 9 panels in a symmetrical grid arrangement. 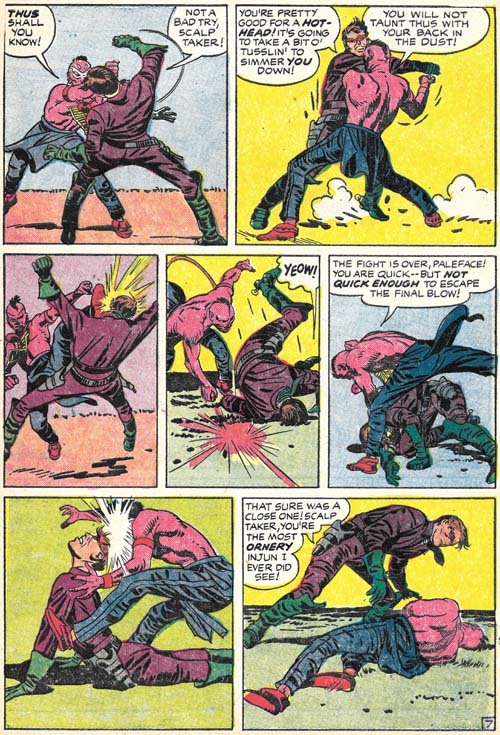 Kirby seemed to like this panel layout for his fight scenes. I feel this layout minimally distracted from the images. Kirby would also downplay or eliminate the backgrounds. Therefore all the attention is drawn to the fighting figures and the choreographed action. Nobody did this sort of thing better than Kirby. 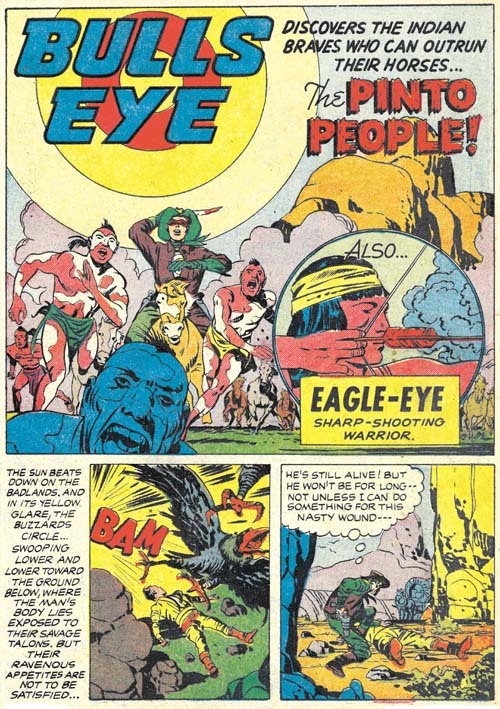 With this issue Simon and Kirby would begin using a backup story that did not involve Bullseye. 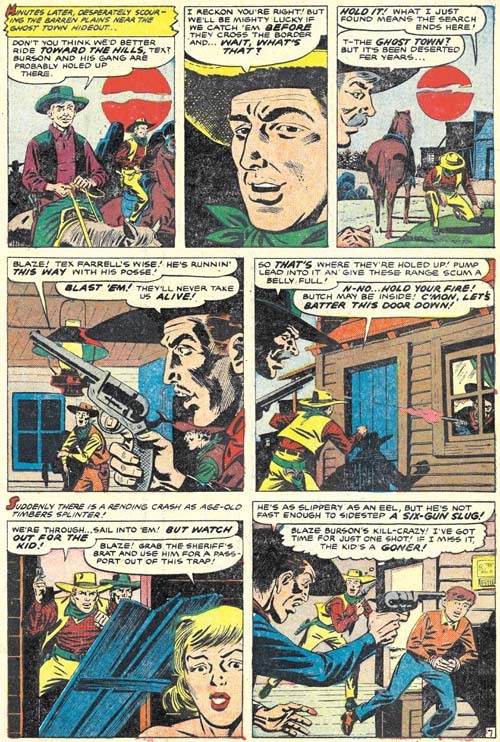 Leonard Starr has the honor of introducing the new feature Sheriff Shorty. The piece appears to be unsigned but hallmarks of Leonard’s hand occur all over the story art. I wrote that the piece appears to be unsigned but note the funny series of short lines along the left splash panel margin over the green pitcher. Frankly I had never noticed it before but recently I had the opportunity to conduct a careful examination of the original art. What the art shows is that white-out was used along both the right and left borders to reduce the width of the image area by a small amount. It was small but enough to cover Starr’s signature which had gone along the original panel border going from bottom up (that is as if the page had been rotated clockwise 90 degrees when he signed it). What remained of the signature was considered too unimportant to clean up. Although covered by white-out, Starr’s signature can still be made out on the original art so there is no question about the attribution. 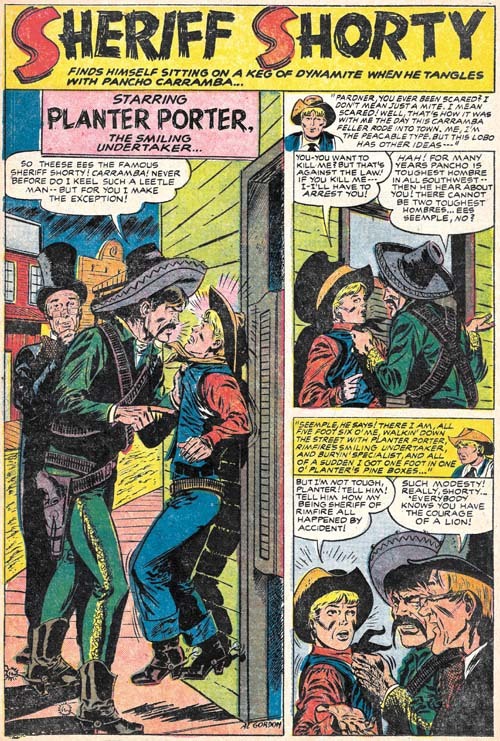 Starr was very fond of using tall narrow panels for work provided to Simon and Kirby. Actually he pretty much got out of the habit for his more recent romance art but narrow panels show up often in the Sheriff Shorty story. But notice the odd arrangement of this page. The last panel almost seems like an after thought and frankly a rather intrusive one at that. Here again my examinations of the original art provides an explanation. The art shows that the last panel was pasted on afterwards and panel 6 had been tall and narrow like all the other panels. Further this was not Starr’s doing. There exists another page of original art that never made it into the story. A panel was cut out of that unused art page and with some rearrangement became the last panel of page 4. This re-editing was almost certainly done by Simon and Kirby and it was the sort of thing that in the future Joe would do very often. As I discussed in the previous chapter, the previous modus operandi for Simon and Kirby was to make much use of Kirby in the initial issues of a new title and then make more frequent use of other artists for later issues. However in general the Mainline titles deviated from that pattern. 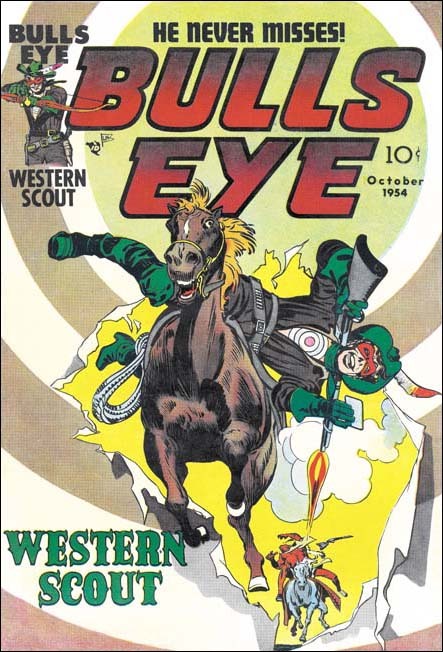 The first issue of Bullseye could be viewed as a somewhat scaled down version of the original MO in that Kirby drew the first chapter and provided layouts for the other two. 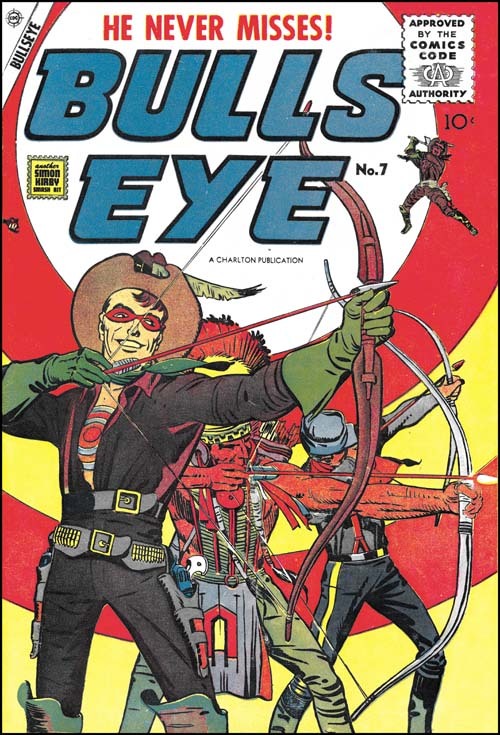 Unlike the first issue, Bullseye #2 was not a long story divided into chapters but instead provided three independent stories each done by a different artist. One of the surprises here was that Kirby did not do the lead story. Simon and Kirby used a lot of different artists during this period. This was probably due to the combination of supply (comics had begun to crash resulting in a number of artists looking for work) and demand (there was a need to replace the normally prolific Kirby who was preoccupied with business matters). 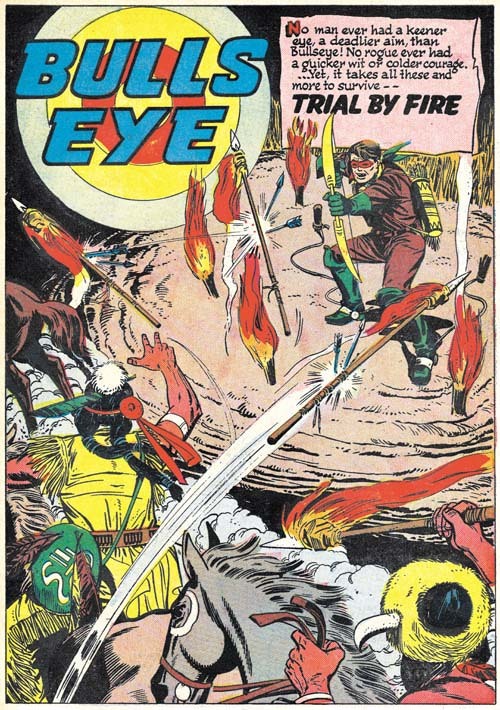 With such a large selection of artists to choose from, I am surprised that Joe and Jack picked this one to do the lead story “Trial By Fire”. It is not that he is a poor artist (he actually did a pretty good job on this story) but I just cannot help feel that someone else (John Prentice or Bob McCarty) could have produce a superior story. As the reader may have gathered, I have not been able to identify the artist although further research should rectify that situation. 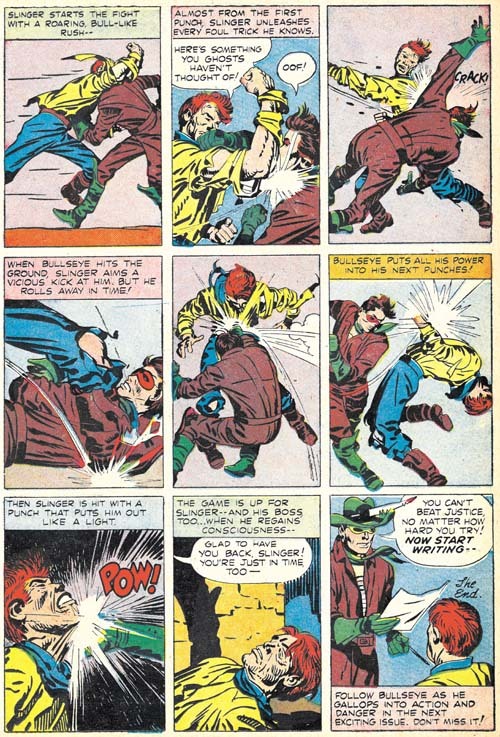 The splash may have been laid out by Jack Kirby although without seeing other work by the artist it is hard to be sure. While it is possible that Kirby laid out the splash, it is clear that the rest of the story was not based on Kirby layouts. I am not saying that there is anything wrong with the fight scene on page 6, but it definitely was not drawn the way Jack would have done it. 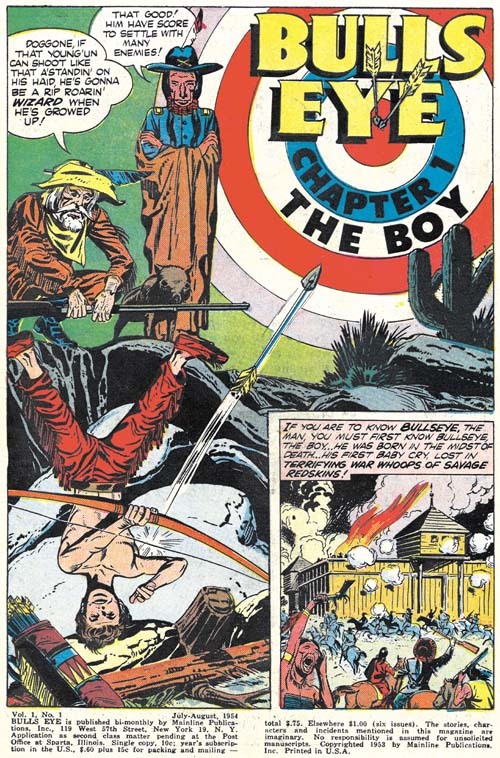 The splash page is a typical Kirby fanfare. What a great splash panel. Back to back, Union Jack and Bullseye take on the world, or at least the room. Bullseye even seems to be enjoying himself. The story panels are also by Jack and he use of tall narrow panels is unusual for him. The inking looks a lot like the work of John Prentice, but that would be surprising as John was not the artist for the rest of the story. For the remainder of the story, pencil honors went to Bob McCarty. 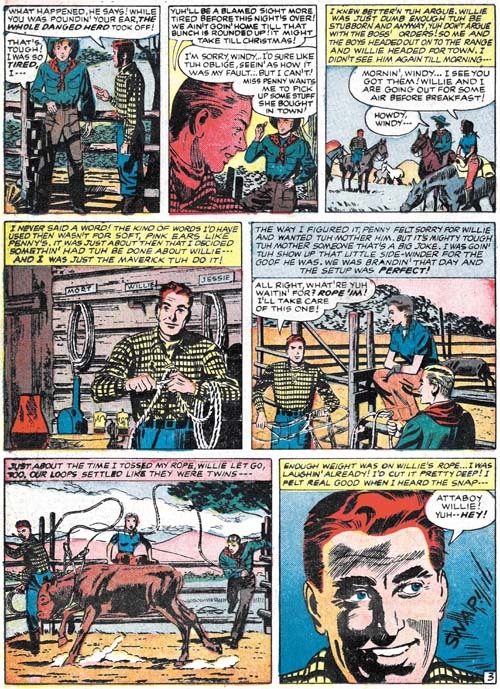 For a short period Bob had become a Simon and Kirby regular and with good reason. This story is a good example of what McCarty was capable of. His handling of action was very unlike Kirby’s, but is by no means a criticism. I am a great admirer of McCarty and this story is arguably the best piece from Bullseye by an artist other than Jack. McCarty typically made much use of a pen in his inking but without abandoning the brush. “Union Jack” shows less of the pen work than usual but I still believe it was inked by Bob. I am not, however, convinced that Bob inked the splash page as well. 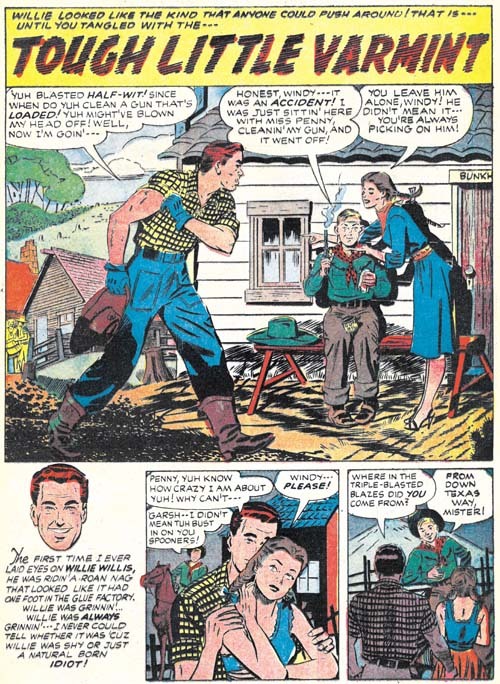 McCarty never signed his work for Simon and Kirby but some of his pieces for Foxhole were provided credits. 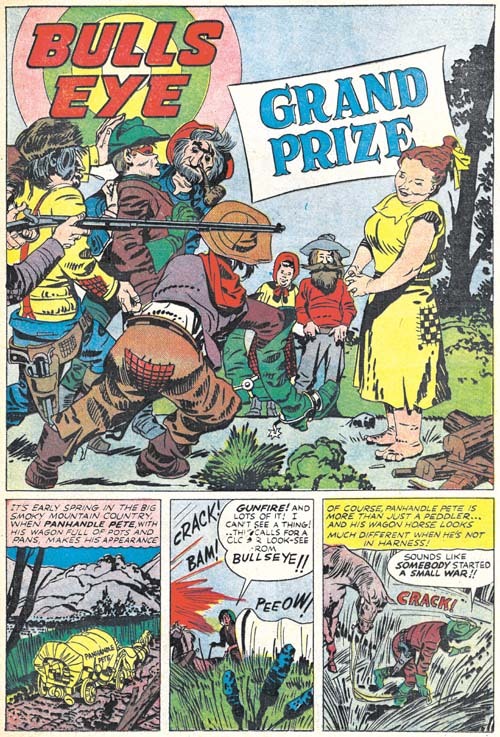 Humor almost always plays a part in Simon and Kirby creations but generally not so dominate a factor as found in “Grand Prize”. It is a marvelous little story with lots of purposely goofy characters and other visual humor. All the more enjoyable because Kirby supplies the inking himself. I suspect it was this emphasis on humor that explains why it was not used as the lead story, a spot normally taken by Kirby.